And now for my Project! I LOVE LOVE Chip and Dale so of course I had to do them! 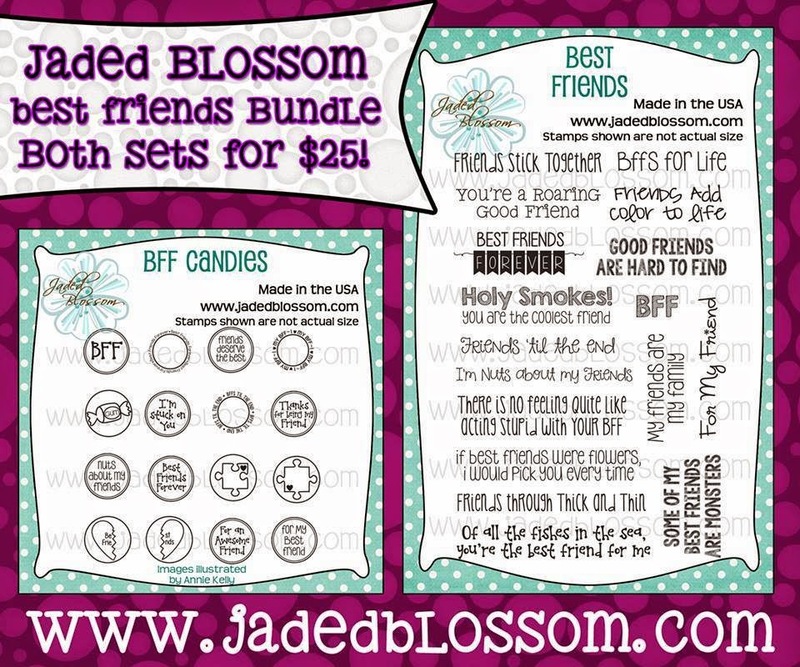 I also used Jaded Blossom's Card Mat Dies and Spring Dies (for the grass). Chip and Dale are adorable!! So Cute! I was wondering who had this file. Super cute. love them! this is going to be perfect for our family Disney pages! chip and dale are too cute, I love your project!! OMG! I love chip and dale. Awesome job. Chip and Dale are the cutest! I was hoping these two cuties would show up on the hop! Love them! Chip and Dale are adorable!! Love your card! Chip and Dale are the cutest. Great job on all the sentiments. Loved the hop! Chip & Dale!!!! Oh my gosh!!! Adorable! Omg. They are super cute. Chip & Dale, been a long time since I've seen them, and they're looking terrific! I kept waiting to see this file. Outstanding - love it! Can't wait to make some cards with this one! Chip and Dale... how sweet. Great shading. Love chip and dale! So cute! Very cute I love your card!! Absolutely adorable. Great work. Must use this for my twin nieces. Aww chipmunks! Love the nuts! I so can't wait to make my dad a card with these 2! (his name is Dale) Awesome Job! I was really hoping we got Chip and Dale! Awwww..... in my best chipmunk voice. Very cute - Luv Chip and Dale! Chip and Dale love it. Great job. I knew these guys would show up sooner or later. Great BFF duo and I love how they turned out on your card. Love Chip and Dale! This is adorable! Over here in Vegas, "Chip and Dale" has a whole different meaning. Too cute!! I love the details to their faces and that nut!! PERFECT!!! Chip and Dale were always so cute. Love this. Love chip and dale. Awesome project! Chip and Dale are so cute ! great job!! Such cute characters! Haha, I love that you gave Chip a nut to carry. It was only after I looked at it again that I saw that Dale has a nut on his head!!! Candace I just asked this question on the Hop FB page but not sure you will see it. 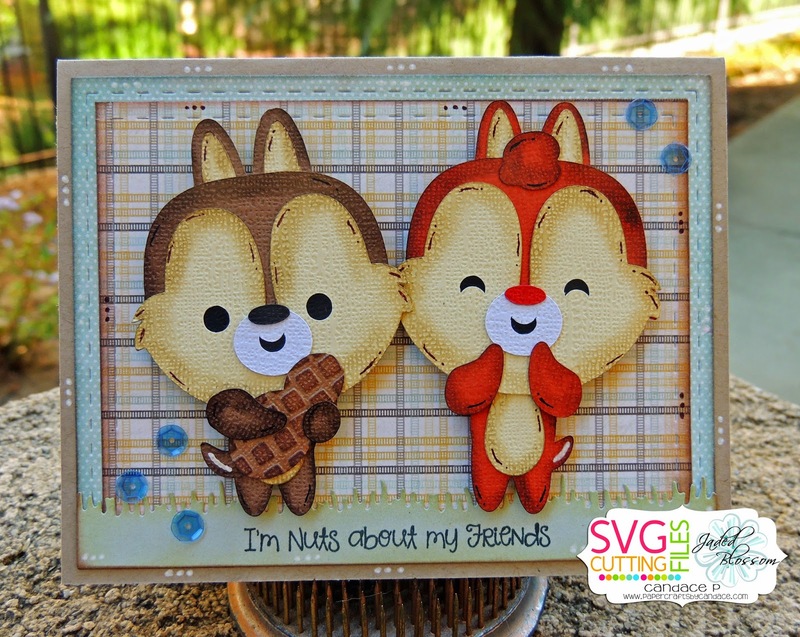 What embossing folder did you use for the peanut? Such memories! Chip and Dale were my favorite cartoon characters. Totally sang the rescue rangers theme song in my head after I saw your post!!! What a GREAT job Candace!!! love those two!! I've always loved Chip and Dale, you've done a great job with them. Chip and Dale! What a great attention to detail in your project with inks and textures!! Wow! Ahhh childhood revisited.....Thanks for this great card. Who does not like Chip and Dale! They truly are best friends forever!!!! LOVE!! Thank you for your hard work. This would be perfect for my parents, who my friends and I called Chip and Dale, back when we were teenagers. Chip and Dale were my favorites when I was a kid! Adorable! Awesome job! Chip and Dale are sooo cute! I will so have to make this! My twin sister is my best friend and we have an upcoming birthday! It doesn't get any cuter than Chip and Dale! love it. I'm so glad nobody forgot about Chip and Dale! I started the hop hoping they would be showcased - Love this!! Ha ha...had to laugh when I saw Chip and Dale because they bring up memories. Great job! Chip and Dale... nice job!! SUPER Cute! I love them!! Love your adorable Chip & Dale! Too cute, love the faces! Love these guys!! The are just too cute! Ok, let me just say that Chip n Dale are my absolute FAVES!! Great card!! Thank you for sharing!! Love Chip and Dale! Your project is so cute too! Simply adorable! Great job on your card:) I love it. Great job on chip and dale! I miss watching rescue rangers as a kid! This little Chip and Dale are sooo stinkin' cute!! Love the way the mat dies work for cards too! Fabulous job!! Adorable! Grew up with these two! Wow Chip and Dale, This hope is bringing back so many memories! I have to say this is one of my favorite. TTS! Chip and Dale! OMG! so adorable!!! Just adorable! Have not seen these two in a long time! I love it. I love your details. Chip and Dale how sweet. Chip & Dale, so cute! The chipmunks are the best friends to get into trouble!! This hop was fabulous as always!! Oh my goodness CRAZY cute! Very, cute. Next to last jump. Awww, so cute and the perfect pair of besties. So adorable. Chip and dale. Cute! Chip and Dale are long time favorites! Who doesn't love them some Chip n Dale?? Super sweet!! This project couldn't be more perfect. HA, Chip and Dale--love them!!! How cute is that embossed peanut he's holding? This is so cool! OH Chip and Dale! love them! great job! Chip and Dale--sooooo cute! Thanks for sharing. Adorable card, Chip and Dale are the best! Chip and Dale...stars of the blog hop. Couldn't be cuter! Great job! The chipmunks are adorable! I love the peanut!!! Chip and Dale are so cute!!! perfect for my Disney trip! Chips and Dale is another favorite. This is just super cute. Cute project! I really like chip and dale! I haven't watched them in forever!